Reuters says officials have discussed limits on ATM withdrawals, border checks and capital controls if Greece goes. 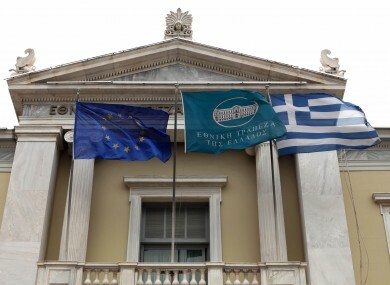 The flags of the EU and Greece fly outside the National Bank of Greece, alongside the bank's own flag, in Athens. EUROPEAN UNION OFFICIALS have reportedly considered a batch of emergency ‘worst-case scenario’ measures to be rolled out if the result of Greece’s election this week means the country could leave the euro. Although polls show a majority of Greek voters to be in favour of remaining in the euro, they also show increasing support for the radical left-wing group Syriza which proposes to reject the country’s EU-IMF bailouts. Should Sunday’s election result in Syriza having enough support to lead a coalition government, the likely rejection of the EU-IMF deals would probably result in Greece defaulting on its debts and being forced out of the currency union. Reuters reports that because there is no formal procedure through which member countries can leave the euro, officials in Brussels now believe there is “an increased need to have contingencies in place”. Though it says no decisions have formally been taken, members of the Eurogroup Working Group – which purportedly features deputy finance ministers, including Ireland’s Brian Hayes – are said to have discussed various contingency measures “in some detail”. Among the measures were the suspension of the Schengen borderless travel area, which would permit the introduction of temporary border checks so that cash could not be moved freely between borders. There would also be capital controls – such as embargoes on foreign currency transactions or ‘minimum stay’ requirements – as well as limits on the cash that people could withdraw from ATMs. Such controls would be considered necessary in order to safeguard the stability of both the euro and a reintroduced Greek drachma, as people would try to bring their cash to whichever side of the border was deemed financially advantageous. In Greece’s case, this could mean a severe shortage of currency, leading to risks of rampant inflation if the Greek central bank had to produce larger-than-normal quantities of the new drachma. On the Euro side, there would also be inflationary risks, as the volume of currency circulating in the union would be disproportionate to the number of countries remaining within the euro area. The Reuters report also carries admissions from some officials that they were not sure whether it would be legally permissible to suspend the provisions of Schengen or to introduce temporary capital controls against a country which would still remain an EU member. Email “Report: EU preparing 'worst case scenario' measures if Greece quits euro”. Feedback on “Report: EU preparing 'worst case scenario' measures if Greece quits euro”.